I’m excited to announce the new payoff plan I’ve been working on is ready to go and available right now. This is an original plan that I have created and it’s exclusive to this site. Essentially, the Debt Blaster is a turbo charged Debt Avalanche (highest interest rate accounts paid first) plan paired with an incrementally increasing total monthly budget. You have the choice between using a percentage increase or a fixed amount increase. The default increment percentage 1%, but you can change it any time you like. Here’s an example of a $1,400 / month budget (on approx. $50k worth of debt) set to increase 1% each month. 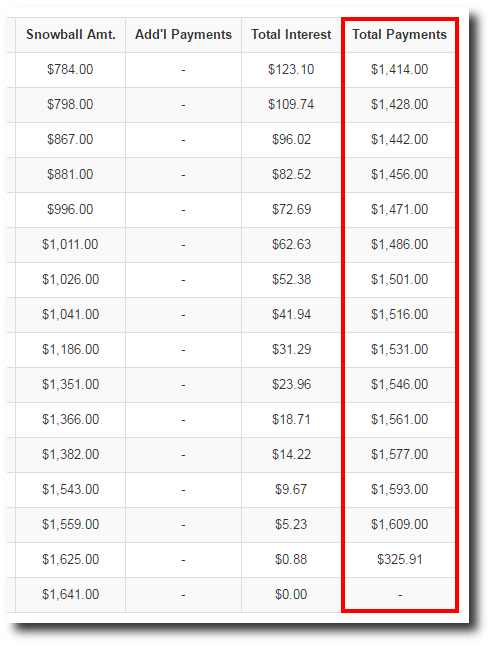 Using compounding interest to our advantage, this example account using the Debt Blaster plan will get you debt free six months quicker versus the debt avalanche plan. The idea is that as you become better at living within a budget, you’ll be able to apply more towards paying down debt over time. Also, income generally increases over time as well and this plan helps make sure you keep applying extra income towards debt. Our old friend compound interest really helps give your debt payoff plan a kick. You can control how much you would like to automatically increment your budget on the My Account page. The images below show the projected payment schedule for the different payment methods for the same account ($50k debt, $1,400 / month budget). The spikes you see every six months are $1,000 debt snowflakes. The Debt Blaster plan is part of the Undebt.it+ premium membership package. Your budget will automatically increase for your every month – there’s no action required on your part. There is a free 30-day trial you can enable if you’d like to give it a shot. If you’ve already used your trial, just use the contact form to send me a message and I’ll set you up with a new trail. A special thanks to those who gave me some naming ideas. “Debt Blizzard” and “The Debtonator” were my favorites, but there are already some debt management products using those names. As always, be sure to check social media for Undebt.it+ promo codes. Who won the naming contest??? I thought I had it with Debt Snowball Squared!!! Previous story New Debt Payoff Plan in the Works – Help Me Name it!